Monarch butterflies lay their eggs on butterfly milkweed plants. 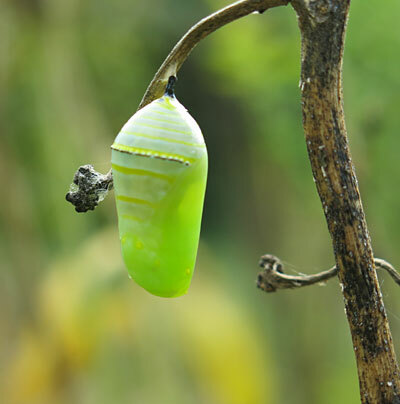 The eggs hatch about four days after they are laid, and the tiny caterpillars, with their dramatic stripes, take about two weeks to grow to their greatest size — during which time they eat butterfly milkweed plants exclusively. Here, a monarch caterpillar is just beginning its metamorphosis into a chrysalis. Here is the chrysalis about four hours later. In 10 to 14 days, a monarch butterfly will emerge. Times are tough for monarch butterflies: For the past few decades, the population of monarchs has declined dramatically. Gardeners looking for the flash of orange-and-black monarchs are discovering that this most famous and beautiful of butterflies is becoming harder and harder to spot. The reason? Habitat loss. Specifically, there’s a lot less milkweed, the single source of food for monarch caterpillars. Milkweed (asclepias) is a common “weed” across the country, but more than two million acres of habitat for butterflies and other wildlife are lost to development — residential and commercial building projects — every year. And, when farmers use herbicides to eliminate all plants except for the crop they’re growing, it wipes out milkweed. This statistic comes from Monarch Watch, a program founded at the University of Kansas in 1992 to increase public awareness of monarchs and their plight. More than 80 million acres of monarch habit has been lost in recent years, according to Monarch Watch. But there is good news: Gardeners can help by planting milkweed. The flowers produce rich nectar for butterflies and many other pollinators, but it is the leaves that the monarch caterpillars favor. These caterpillars, with their dramatic black, yellow, and white stripes and delicate horns on each end, are voracious consumers of milkweed plants. Don’t worry about the devastation: milkweeds are perennials, and they are very tough. They’ll come back and bloom again year after year.The key is choosing a species that thrives in your region. 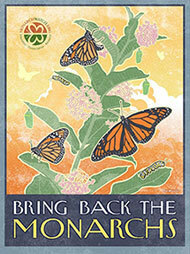 To help restore the monarch population, Monarch Watch launched the Bring Back the Monarchs campaign in 2010. The program’s goal is to restore 20 milkweed species to their native ranges in the United States, improving the habitat for monarchs and other pollinators. The program also encourages gardeners to create monarch waystations in their gardens at home and at schools, parks, and nature centers and along roadsides. About 7,400 waystations have been certified, says Chip Taylor, director of Monarch Watch. “That’s a good start,” Taylor says, “but the scale of habitat loss has been so great that we need about 7 million gardens with milkweed and nectar plants for monarchs and other pollinators,” he says. Monarch Watch is planning to distribute 40,000-60,000 plugs of native milkweed plants this year through its milkweed market. The organization’s web site also lists close to 100 sources around the country for milkweed plants. They’re easy to grow, drought tolerant, and many species have showy flowers. When you plant milkweed, you give monarch butterflies a better chance at survival, and welcome their cheerful flash of orange-and-black to your own garden. How about Butterfly Weed? I understand it is a type of milkweed, and I am planning to plant some this year. Milkweed established here. I saw one Monarch the entire season, and that was miles away at a shopping center. It was nectaring on a butterfly bush. I got to wondering what I might have done wrong. I am not sure if shiny things deter butterflies like they do birds. But is it possible that the spinner and the whirligigs and the windchimes made my yard less attractive? I use no pesticides and have many pollinator -friendly plants . Would you know if it is possible? My milkweeds did not grow in vain. I harvested seed and sent it to Monarch Watch for cultivation. I would love to hear your thoughts on yard ornamrntation. I am just starting to establish a butterfly garden this spring and summer. I am planting all plants suggested for the butterfly garden. I dug up and transplanted about 8 milkweed plants from the wild last fall but only one seems to be growing. I really do not want to pay a lot for milkweed plants when they grow wild all over my area but I’m wondering if you know why they didn’t take. Should I try it again this fall? Getting very excited to have my garden a haven for butterflies, hummingbirds and bees. We have started a butterfly garden this spring at our local s hook, the garden is going great including the milkweed, all of our plants are native. What type of winter care do we need, pruning or mulching or just leave alone? Thanks. Leave up for winter; cut back in early spring, before they start growing again.